65. To make Tea Cakes. Take half a pound of Flour, 1/4 of loaf Sugar, rolled very finely, two eggs, and 4 oz: of Butter mixed together with a proper quantity of Caraway Seeds, the eggs & Butter will sufficiently moisten it. 66. To make Carrot Soup. 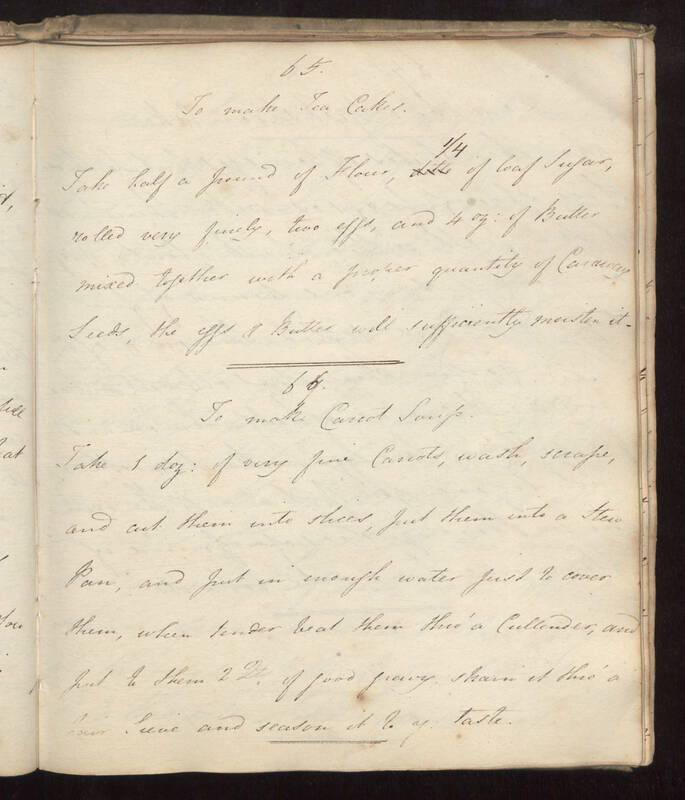 Take 1 doz: of very fine Carrots, wash, scrape, and cut them into slices, put them into a Stew Pan, and put in enough water just to cover them, when tender beat them thro' a Cullender, and put to them 2 Qt. of good gravy strain it thro' a hair Sieve and season it to y taste.